"Everything that sustains us – grown, mined, or drilled – begins its journey to us on a low-volume road (Long)." Defined as roads with traffic volumes of no more than 400 vehicles per day, they have enormous impacts on economies, communication, and social interaction. Low-volume roads comprise, at one end of the spectrum, farm-to-market roads, roads in developing countries, northern roads, roads on aboriginal lands and parklands; and at the other end of the spectrum, heavy haul roads for mining, oil and gas, oil sands extraction, and forestry. Low-Volume Road Engineering: Design, Construction, and Maintenance gives an international perspective to the engineering design of low-volume roads and their construction and maintenance. It is a single reference drawing from the dispersed literature. It lays out the basic principles of each topic, from road location and geometric design, pavement design, slope stability and erosion control, through construction to maintenance, then refers the reader to more comprehensive treatment elsewhere. Wherever possible, comparisons are made between the standard specifications and practices existing in the US, Canada, the UK, South Africa, Australia and New Zealand. Low-Volume Road Engineering: Design, Construction, and Maintenance is a valuable reference for engineers, planners, designers and project managers in consulting firms, contracting firms and NGOs. It also is an essential reference in support of university courses on transportation engineering and planning, and on mining, oil and gas, and forestry infrastructure. How Much of the Full Process Is Actually Carried Out? Which Is Preferable, Erosion Control or Sedimentation Control? Robert Douglas has over thirty five years' experience in low-volume road engineering consulting, teaching and research. He has been a senior geotechnical engineer with an international consulting firm, and on the academic staff of forest engineering programs at the University of New Brunswick, Canada and at the National School of Forestry at the University of Canterbury, Christchurch, New Zealand. 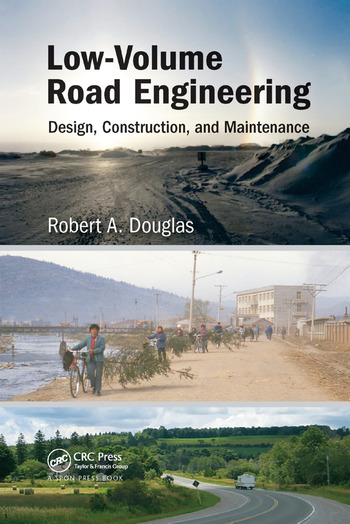 "A useful source of information for designing, building and maintaining roads, many of which may be constructed in rural areas in developing nations." "This book treats low-volume roads in the broader context of transport connectivity and logistics, emphasizing the quintessential role such roads have in improving access and mobility, especially in rural areas... There is no recent book in the market that is comparable to this text." "It is simple yet informative and makes the reader interested in the topic. [A] well-written book." "I like the approach and the selection of topics, which presents technical but also philosophical contents. … intrigued me enough to want to have this book on my shelf."